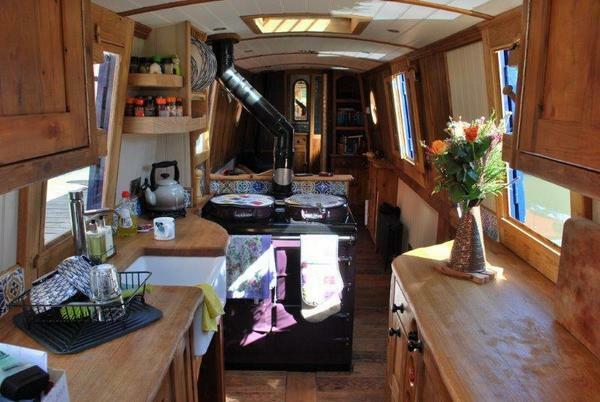 After a chance meeting on a cycling holiday in Jordan, Aileen and Mike can now cycle together along the towpath next to their beautiful floating home as they continuously cruises the connected waterways of England and Wales. I’m 46 and from Edinburgh and enjoyed life there working at Edinburgh University with a good social life. I met Mike on a cycling holiday in Jordan in 2010 and we married in February 2013. Mike was due to semi-retire in 2014 and we decided we wanted to do some travelling but without the hassle of packing up every time we moved. Neither of us had really done the UK extensively, so we decided that travelling on a narrowboat that was our home fitted the bill – we could explore the UK with not a suitcase in sight.Â We had taken a few holidays on narrowboats, and it rained a lot, yet we still came home having loved every minute of it. Quaintrelle. Well, we couldn’t decide on a name, so I posted on Facebook for suggestions and said the winner would get a week on the boat. Some of the suggestions were awful, but we shortlisted our favourites and got friends to vote. We didn’t really like the winner. 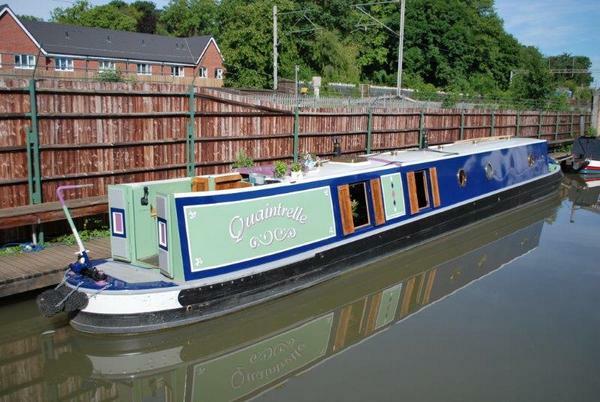 Then a friend posted the word Quaintrelle on Facebook, saying she aspired to be this, the definition being; a lady who lives life passionately through leisurely pursuits and looking beautiful – exactly what our boat is! No. We are continuous cruisers. 57ft semi-trad. 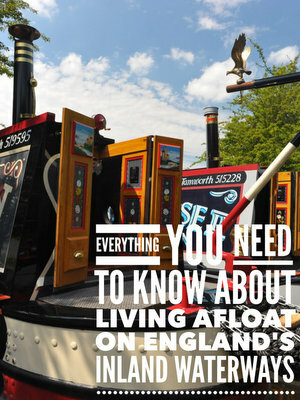 (You might have seen her in September’s Waterways World – they did a boat test on her). We were in a fortunate position that we were able to purchase outright from the builder with staged payments. 11 months probably, we live on her permanently, but will maybe head off somewhere warm for a few weeks in February. Mike has his own business, so he still does a bit of consultancy, and I do the admin for him. We’re still very much in the honeymoon phase and have had a wonderful summer, but I guess it’s planning when you need a pump-out/water/diesel and making sure that you’re somewhere where it’s all available. 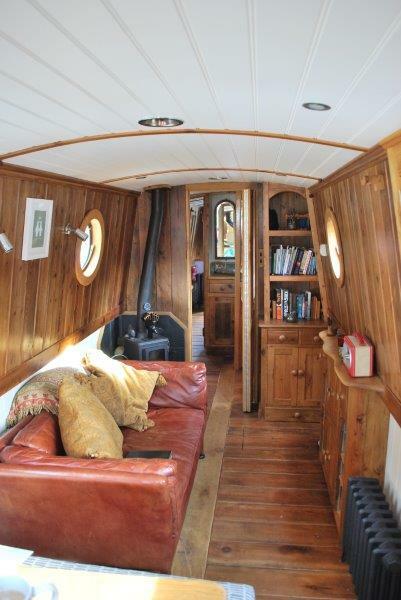 Oh, and washing the boat……..
We have a compact washing machine on board. We have used laundrettes for bedding and towels when they’ve been to hand. We have a pump-out toilet with macerator.Â Very pleased with it, it is just like a normal toilet.Â It does get a bit pongy when it’s almost full, but that’s just boating life for you. We have a Huwei mobile dongle, 3G. It’s been fantastic, only a couple of places in six months where we’ve had no service for a couple of nights. Gosh, we’ve only just begun….. I did love the Leeds Liverpool on the Skipton to Foulridge section, going across the dales, so looking forward to doing that in Quaintrelle at some point. We move most days, so the leisure batteries get charged up. We use about 10-15% overnight.Â We’re always careful to do washing and anything that might use a bit more power whist we’re moving. We haven’t had a winter yet, but we have a diesel powered Heritage Stove on board which provides hot water, central heating and cooking. We also have a solid fuel burner. In the last week we have had the solid fuel on, but found once we’d cooked on the Heritage we had to open the windows as it was too warm. So I think we’ll be toasty. Do a few holidays first, in all sorts of weather. See if you think you can live in the space. Ask all the obvious questions on forums and use Paul’s calculator to see how much it will cost you. Everyone seems to think it is cheap as chips, and whilst at the end of the day it is cheaper than living in a house, there are still costs. If you want to find out more about Aileen and Mike’s travels you can read their unusual but very effective Twitter boating blog.